Forty-five million Americans are currently living in poverty. For these families and individuals, a warm coat is a budget extra they simply cannot afford. 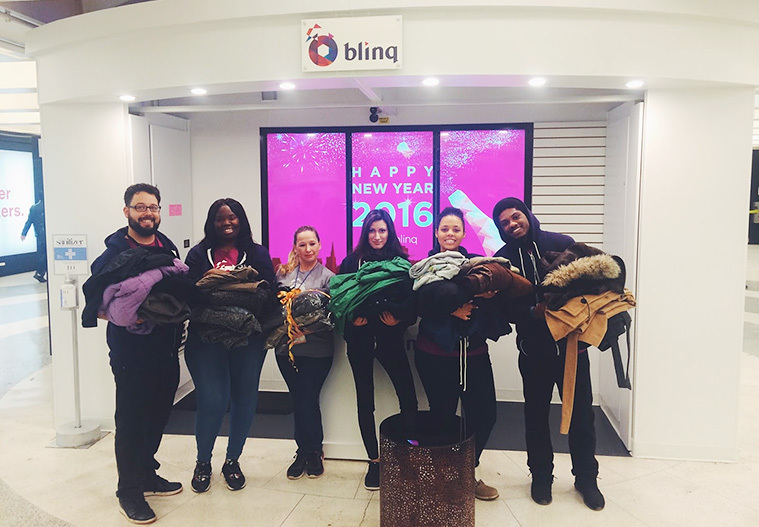 During the final weeks of 2015, blinq partnered with One Warm Coat to collect clean, gently used warm coats, and dollars to support the coat drive program. Over the three week period, we offered our pods as donation stations for people who wanted to drop off coats and donations for people in need. Our blinq Brand Ambassadors John, Tikiya, Kayla, Geranddis and Evelyn (pictured below) collected 44 coats in all, and will be handing off the items to the St. Anthony Foundation, an organization that provides essential support to San Franciscans living in poverty. Missed out on the coat drive but still want to give? You still can! Text “WARM” to 80100 to donate $10 to One Warm Coat, or visit their donation site for more options. “For more than 20 years we have been working to provide a warm coat to anyone who needs one. We are so thankful for our many coat drive ambassadors, like blinq, who volunteer their time, resources and energy to help their neighbors in need. Together, we can reach our goal of warming one million people each winter, one community at a time!” commented Jennifer Stockard, President and Chief Executive Officer of One Warm Coat. One Warm Coat is a national non-profit organization that works to provide a free, warm coat to any person in need and raises awareness of the vital need for warm coats. One Warm Coat supports individuals, groups, companies and organizations across the country by providing the tools and resources needed to hold a successful coat drive. Coats are distributed in the communities where they were collected, to any person in need, without charge, discrimination or obligation. Since its inception in 1992, One Warm Coat has worked with its volunteers to give away over 4 million coats.